Opening on May 22, 1985, Rambo: First Blood Part II was a fantasy fever dream of jingoism, Sylvester Stallone’s titular character a monosyllabic redeemer of an America that had failed itself in Vietnam. A onetime Green Beret, Rambo needs little more than 90 minutes to rescue abandoned POWs and somehow salvage his country’s intervention in foreign affairs. The movie made more than $300 million worldwide. Coleco, which had experienced a phenomenon with the Cabbage Patch Kids, snapped up the rights to produce a toy line. Neutered for young audiences, this Rambo practiced greater discretion, bloodlessly assaulting enemies in a Saturday morning cartoon. Coleco hoped Rambo: The Force of Freedom would compete with Hasbro’s G.I. Joe for a share of the military-oriented action figure market. Hasbro, which wasn’t about to touch an R-rated film, decided to combat their potential toy aisle rival by enlisting Stallone’s other trademark character: slow-witted boxer Rocky Balboa. It wasn’t the first time the company pursued a license for a figure that had been established outside of G.I. Joe continuity. Hasbro had released Sergeant Slaughter as a premium mail-away attraction in 1985, co-opting the popular professional wrestler’s recognition among WWE (then WWF) fans. 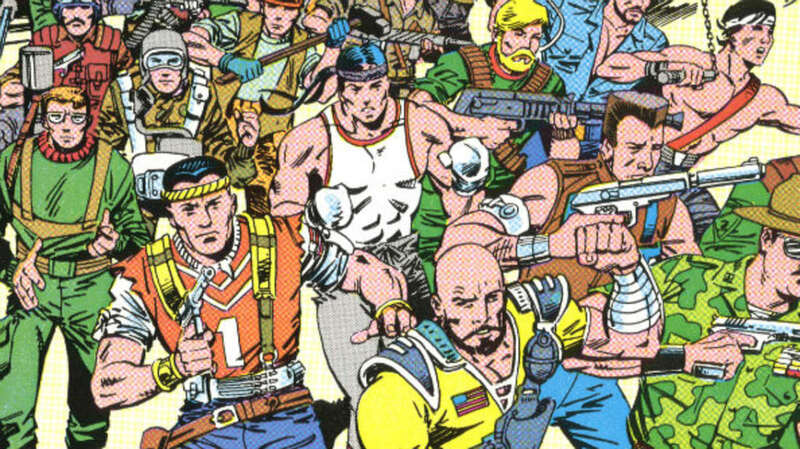 Slaughter was a success in toy, cartoon, and comic book form, helping reinvigorate a G.I. Joe line that had been on shelves since 1982—an eternity in action figure years. Hasbro hoped Balboa would do the same, aiming to release a mail-away premium figure in 1987 that would be available to customers who sent in proofs of purchase from other G.I. Joe merchandise. Establishing Rocky’s place in the mythology of the G.I. Joe universe fell on Larry Hama, writer of Marvel’s G.I. Joe comic and a frequent source for hammering out narrative points across the franchise’s many outlets. In a Marvel collection of character biographies titled G.I. Joe: Order of Battle #2, released in late 1986, Hama scripted a brief rundown (above) that presented Balboa as a combat trainer, filling obligations for his "Reserve time" by turning their hands into semi-deadly weapons. For kids not yet weaned on crossover movies, this was an exciting prospect: anyone picking up Order of Battle #2 probably imagined a scenario in which Ivan Drago would somehow be dragged into Joe nemesis COBRA’s operations. But it was not to be. In the very next issue of Order of Battle, Marvel printed what must have been one of the few retractions over the appearance of a fictional character, explaining that Balboa’s debut in the previous comic had been a mistake. It was written with the sober language of someone who had just been yelled at by a lawyer. Although they had recruited the more famous star, Coleco wound up enduring protests by antiwar groups angry that the Rambo toy line appeared to be glorifying combat. The accompanying cartoon lasted just a few months. Stallone’s likeness has never appeared in any subsequent Joe revival, but Hasbro did wind up releasing a villain in 1987 dubbed Big Boa. Considering his boxing gloves and punching bag accessory, it’s very likely he was originally intended to be a personal nemesis for Rocky. Thanks to some legal red tape, he never got to take his swing. All images courtesy of Tim Finn, author of the upcoming G.I. Joe history A Real American Book.